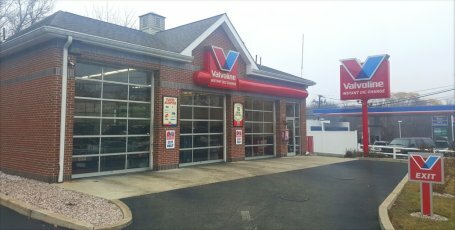 Valvoline Instant Oil Change Woburn, MA, 320 Montvale Ave. The people were friendly and the service was quick. Tina McCauley was great she talked me through the whole oil change. She is a great assistant manager very friendly and she interacts with her costumer. Engaging in communication. The staff also at this site was very friendly and amazing snd Ryan did awesome i had a screw that was stuck and Ryan got it out with the help of other staff members. I'm always impressed with the communication between staff members...pardon the pun, but it's a well-oiled machine. I think the process as well as the convenience will have me coming back for a while. I had fast friendly service and had a problem putting the connection back right and they fixed it for me. Been coming back to this location for a long time and the staff are very friendly and helpful. Very expensive for an oil change on a work van. Next time i will most likely go with regular oil but still it is more expensive than a dealership. As referenced, there were repeated attempts to sell a service that I’d already indicated I didn’t want. The gentleman who helped me was so nice and helpful. He was honest with the services I needed and what could wait. In the past I have felt pressured but this visit was different. He also noticed the new wipers I just got still had the caps attached and pulled them off for me! The staff at this location are all very nice. I never feel like i'm being swindled as i have at some other places. I appreciate that overall the most. When I got back on the highway, my car alerted me that all my tires were inflated between 39 and 45 psi! If you can’t get simple tires right, what else is lacking? I needed some additional service for a road trip I’m going on. All my needs were met and the manager was very knowledgeable! Had to wait while other cars that came after me went through servicing. I stopped counting after five cars that cam after me had been service before I pulled into the bay. Usually I feel pressured into buying things, but these gentleman were very professional and informative without being pushy. Loved the knowledge of the Technicians. The staff was extremely nice and explained to me what services I needed at the visit and what is needed in the future. She educated me about my car's needs without pressuring me. She was also very kind to my son, who was asking questions about the oil change. Her professionalism and manner make me want to return to that location, which I've never cared about in the past. You have convenient centers, knowledgeable staff who do not try to sell you more than I need, and it's quick enough. Wait was too long. Never received a receipt. Manager and staffs were very kind. This particular Valvoline Center always does a through job, makes appropriate recommendations, does not try to "up-sell"
I needed a new car battery, I was greeted as soon as I pulled up, the man who greeted me was kind and helpful. Once there was a stall available I pulled right in, they started changing my battery right away. It was a quick and easy experience and I was able to get on with my day promptly. The service was prompt and I liked that I could remain in my car while the oil change was complete. I was also pleased to see that they filled up the air in my tires and made sure blinkers and brake lights were working. Everything was great and very fast. Price could be a little bit more satisfactory, synthetic blend oil change for $63 after $7 coupon? I would think $53 would be more in line, there are always specials out there for $24. 99 every month . I had to wait a little longer than I wished. There was some whispering going on between staff and it made me feel slightly uncomfortable. I was greeted promptly. The staff were knowledgeable, I felt no pressure to have extra services. They took a good deal of time to explain what they were doing and why. Overall, the experience was ok. The cost was way more than anywhere, but the ease of just pulling up and getting it done made up for that. The upselling was ridiculous. In the bay next to me, there was a gentleman getting his oil changed and there was no upsell. He said no and they moved on. As a female, I felt targeted for upsells and talks of how my car could die if I did not do the service. Spoiler alert, they couldn't get the plug out to do the service and then told me my car would be fine without it. So wait, you told me my car would die and now tell me it is fine? I understood each step. The manager[can't remember her name] helped me shut down the "change the oil" light on my dashboard quickly and easily. That is something more complicated than usual. A friendly, quick job done. I usually go to this location, and will continue. Thanks! It was good. No complaints. CSR was awesome. Explained recommended services to me, their importance, but in an informative, not pushy, way. Jim, Rick and staff were friendly, informative and efficient. Great service,good communication ,was a well run shop. Was driving home from out of state when oil light came on so pulled off at the next exit and ended up here. Great experience, knowledgeable employees got my car safely back on the road in about 15minutes. Everything went smoothly, quickly and efficiently. Service was great..Didn’t feel pressured after they explained additional recommend service. Good quick service. They make recommendations to you. I really don't appreciate the upsell. I went in for an oil change (an expensive one at that, compared to local garage) and that's all I wanted/needed. I can't stand how you guys try to sell so much more than the oil change. I will not be returning. The employees provided great service. I knew I had needed to do a transmission flush soon, and they explained why it's important. They also helped me replace a nagging front directional, and showed me how to do it for next time, as I was having a difficult time on my own. I have been going for a while now , they are always friendly and quick. To say I was highly satisfied would imply that there is no need for improvement. What goals would that set for a company’s growth and future training. Super friendly staff. Tristan was very methodical checking each component/check list item. Jeff (?may have been manager) super positive person, very knowledgeable, and had a great Thanksgiving story. Always like coming to Woburn (near work) and Waltham (near home) Valvoline’s. Always honest, professional and curteous. Only offers additional service when recommended. As always, everyone was nice and everything was done quickly. Enjoyed the service, the workers all took their jobs seriously and presented themselves as enjoying what they do for a living. I felt the techs were honest and sincere. I had a great experience overall! Like seeing women employees. I never feel intimidated like I do at the Honda Dealership. The employees are friendly and courteous. I see many familiar faces over the past years and to me that means a lot . The gentleman that helped me was friendly and knowledgeable about the service being performed. Also, he assisted me in resetting my oil change monitor. The staff was great. I also had my dog with me and they were so friendly to my dog. The employee who checked over my car went above and beyond. I came in looking for an oil change which I knew it was early but my light had turned on. I was informed my transmission fluid had not been done when I had originally bought my used car in April and thankful he had checked everything for me because if he had not my car would probably had been ruined if I continued on. One individual attempted to scare me into using the synthetic oil, mentioned $8000 repair costs. Highly Satisfied that i was able to have a diagnostic check for free and was able to find out other issues wrong now i can fix without additional charging. Three women worked on my vehicle. Very happy about that. They were courteous and did a great job. Didn't try to sell me things I didn't need. I felt very confident in their work and will go there again. Wait was really long. Tried to push upgrades to much. quick efficient service; very pleasant staff. Loyal customer at this location. Staff is always kind, respectful, and efficient. I go to this location every time I need a oil change. The employees that work there are very nice and professional. The several people I talked to were very friendly and helpful in answering my questions. Everything went smooth. Staff friendly and knowlegeable. as always. Everyone was very friendly and informative! Service was fast and efficient - especially considering I was in a pinch for time. They were great! Would definitely return! great service, awesome people good price! The technician seemed to know a lot about my vehicle. Wait time was longer than expected. Cars were having services that took a longer time than an oil change. I thought that only oil changes were done. I've never had a time when one of the staff wasn't pleasant and always helped me with my car's maintenance. Tina is fantastic. I see her there almost every time I come in for service and she is always knowledgeable and a pleasure to talk to. Everyone else on the team does a great job, as well. No one is perfect. Not unhappy in anyway. Very courteous and friendly staff. Quick and thorough service. During my visit, everyone was professional, personable and courteous. The staff respected my time and made recommendations without pressuring me. I have been to this location many times, and have always been treated very well. It was fine. An oil change just always costs more than I expect it to, and there's always another thing that needs maintenance on the car. So, nothing wrong with your company or your staff. Just the hassle of owning an automobile. This site has always been professional and does not "up-sell." All services are explained fully. Fast, friendly. Works well for my morning commute. I was completely satisfied with the service I received but was interested in having my tires rotated. UnfortunatleyI was told my Chevy Silverado 1500 was too long for their bay and they could not do the tire rotation. I really like using my local Valvoline center for my auto care so am disappointed I need to go elsewhere for the tire rotation. I thought that it was expensive, even with a $7 off coupon. I generally pay much less at Sears Auto service but like the convenience of Valvoline. My first visit to Valvoline was because of a Groupon offer that I got. I’m not sure I’ll return because of the expense. Also, I was very surprised at the high price of changing the 2 filters in my car. $40+ dollars for a $10 filter? No thanks. As a former ASE Certified Master Truck Technician and currently still employed as a Bus Maintenance Foreman at a major Transit Authority, which I communicated, I do not appreciate being lectured on the usage of the oil I choose to use in my vehicle, ie. : Synthetic vs Conventional, Toyota recommendations, etc.. Sometimes they rush and over look things.. The service and personnel were very good! Access from the main road was difficult to enter and exit the facility. I have used this location many times and everyone has been great. Positive additive of workers. They were friendly and knowledgeable. Every time I go to Valvoline, and I am a regular, loyal customer, the staff always attempts to upsell me. Every. Single. Time. Never have I gone in for an oil change and just paid for an oil change. This makes me think it is an organizational mandate. That there are bonus structures based on the amount of upsell. It really gets uncomfortable at times. It's why I may try Jiffy Lube next time to see if they do this too. They took me without causing me to wait as i was in a hurry. Staff is very professional, knowledgeable, courteous & friendly. Everyone was great. All the people were very professional, knowledgeable , efficient and had a high degree of customer service. My one and only issue was that I would have purchased the “MAXLIFE” oil blend rather than the full synthetic since that would have been the less expensive option. However they were out of MAXLIFE. Not sure if they decided not to carry MAXLIFE at all or this was just a one time thing.Other than that, Everything was perfect. They helped me apply coupons I had for the oil change and the tire rotation also. They only offered premium synthetic oil which is very costly. I paid for it but did not need it. I was in a time crunch and did not have the time to go elsewhere. I was out in 11 minutes. Staff were great! The customer service rep working the register at the bay was extremely personable and I had a pleasant conversation with her. This made the time pass quickly! The technician was a woman. She seemed not interested, and annoyed as well. When she spoke to me to explain things her eyes looked away at all times and no eye contact was made. She also spoke so fast and nonchalantly that I barely understood what she was saying. Very unprofessional. I have been to this location before and was serviced by a different employee and the service was great. Friendly and communicative staff members. They gave me info on items they felt needed immediate maintenance and those that should be done soon with reasonable timelines for when I should try to return. Great staff...very courteous and accommodating.In and out in about 15 minutes, it was great! They determined that I had a leak and recommended I see my mechanic. They then topped me off with 2 1/2 quarts for free and sent me on my way. I will definitely be back. The associate who helped me with my oil change was very knowledgeable about cars, but specifically about VW's and gave me tips and pointed out things that I was happy to learn about my VW. He was thorough in explaining what the car needed and why. The crew was friendly and very quick! I will always go to my Valvoline because they are so dependable and personable. Thanks! I like the friendly communication with the staff. Appreciate the speed the work is done. Enjoy not having to get out of the car. Great service, no wait and very professional and knowledgeable. Took my coupon for $10.00 off. Service was fast, very thorough and serviceman explained everything he was doing and work that needs to be done. I’ve been using this specific Valvoline for about 2 years now, every time the staff is knowledgeable and friendly. I love that when they take care of my car they aren’t trying to sell me more than what I need, I’m always showed the screen of what is recommended and hen they talk through my options. I have an eco boost car so I do need the more expensive oil, but every time the staff still talks me through why it’s important which is nice. Professional, courteous & respectful staff. The service was fast, suggestions were made without being pushed, and they were extremely friendly. It was so much quicker than going to dealer and waiting for up to an hour for "express service"
Not only do we use this facility for our work trucks, I also use it for my personal vehicles. The staff is always super friendly. They make honest recommendations and don’t try to push extra services too hard. I felt the prices were a little high for radiator fluid flush. Manager - staff all top notch- absolutely no pressure on any additional services whIch I did end up having done. Fun loving engaging staff that seemed to truly enjoy what they do. Tina was very knowledgeable and courteous. I brought my own filter and had to pay additional money for you to install which is ridiculous since you are checking in any. Felt like I was nickel and dimed for a $100 oil service. For that money and can go to my mechanic and get my tires rotated too so i will probably go to my mechanic for future service. $80 for an oil change is way way over priced. They did a good efficient service, I liked it and will go back. No complaints. Everyone was friendly and courteous even though it was in the mid 90's and very humid. It took a very long time to get into the bay for service. They also shifted the lines of vehicles around because some were done before others, which was weird and time consuming. The attendant was pleasant, personable and knowledgeable. He explained everything with the proper level of detail as well as at the appropriate level so that I could understand. The techs you guys always have are great. I wish I remembered the name of the gentleman who took the lead with my service he was courteous, friendly, helpful and efficient. He made a couple offers on additional services but didn't make me feel like I had to do it and he also was successful in getting me to change my Cabin filter for an additional $39.99 which I originally had not planned on spending but after speaking with the tech and him showing me all the buildup on my filter I decided it was best to get the change and I am very satisfied I did. Also Shannon who helped out was great and the manager of this location is always in a good mood and treating both customers and staff well which I like to see in a leader. I also wanted to clear up I mentioned I waited more than 15 minutes to be seen but I was ok with that. It was the day before the 4th and the bays were packed with people like myself who were getting their oil changed before a long drive. Overall for the place in line I had when I showed up the wait was very reasonable and I didn't think I waited too long at all. I was in and out in less than an hour which was fantastic. The staff is always friendly, helpful if I have additional questions and never tries to pressure me into purchasing extras. I feel they are honest and upfront with me about the condition of my car overall. As a result, if they were to suggest I needed something changed or fixed at later visits I would be more inclined to trust their opinions. I had to wait behind another car longer than other says, but the technician came outside and performed the safety inspections on my car so that my visit ended up being about the same length of time. The speed is fast. Other than oil change, the staff topped the windshield wash fluid, fill the tires with air, and pretty much everything I could think of. Everything went very smooth and was very quick. Friendly and very knowledgeable people working there. Clean shop.Very impressed. Customer service was outstanding! Staff were super friendly, they knew what they were doing, and they engaged with the customer (me) to keep me informed about what was happening. Definitely going back to the same location - Montvale Ave. in Stoneham, Mass. Thank you! I think the price of over $100 dollars for an oil change is way too much and I will most likely have to do it myself next time. I did not have any problem with the service itself and the people were good. Explained my choices, if there was something I didn't want, I wasn't pressured into it. The staff was professional worked in complete synchrony with each other and actually took the time to talk to me about what they were doing. Very professional , informative and genuinely nice. I got my oil changed and tires rotated and it took about 40 mins. The employee was banging on my tires with a rubber hammer for the majority of the time with significant force( enough to shake the car while I was onside). I’ve got my tires changed in the past and have never expierienced this techiquie or length of time to complete. As always the service people explained each step they were conducting, explained recommended services based on mileage etc.,and made sure I was satisfied with everything before leaving. Communication between them was good and they wasted no time, allowing me to get on my way as soon as possible. The staff were fantastic. I’ll be back! Price. The price of an oil change at valvoline is 2-3x what you’d pay elsewhere. Also, I was told they didn’t carry the (lower tier) oil recommended for my CRV and this would be required to use the (more expensive) full synthetic option. Also, valvoline is relentless in attempts to upsell other products/services. The guy that assisted me in the morning was amazing! Due to how great he was I brought my husband in the afternoon! Unfortunately, he was not there and the service we received in the afternoon was awful! The crew was amazing. Well versed, well dressed, very good at their job. A great representation of the company. I was there (Woburn, MA) super early before work. All the computers were down due to a Comcast nationwide issue. My car was finished, the computers were still not up and running. I work up the street at Interstate Batteries, they took my work number and cell phone number and said they would call when the computers were up. About 2 hours later they called, ran my card and emailed me a receipt. I was not late for work! I don't know if they would have done this for me if I did not work for Interstate Batteries, but I really appreciated what they did for me. Not only were they professional...they were VERY helpful and answered all my questions. They took the time with me and my vehicle and didn't rush me at all. I am super impressed with them AND choose them over going to where I live in NH. They are near my work and I prefer them instead! Tina especially was really kind and helpful! The staff explained everything recommended, when I declined the gear oil change there was no pressure to do the work. After a few moments I changed my mind and had the gear oil changed. The rep. Kept telling I should do this service or that service. I was there simply because my husband didn't have the time to do it. Assistant Manager – she was great. Staff worked quick and swift; seemed to be enjoying each other as well as their work. My first visit there and felt very comfortable. The person who helped me was very cordial and pleasant. Service was very quick and professional. Very quick service-oil change and tire rotation. Service person explained everything options, price and what he was doing. Great customer service. Great communication, realistic recommendations, friendly attendants. I felt the serviceman was knowledgeable not only about what services I was purchasing, but also about my car. Excellent service and courteous workers! The staff here is always friendly. I've never had to wait. They always finish quickly. Overall the best way to do something none of us want to do. No waiting,friendly atmosphere,seem knowledgeable,very good experience. Though overall a good experience, there was a bit of a wait and some confusion as to which bay my car needed to be in for the tire rotation. Quick and convenient. Much more expensive than my usual mechanic tho. Staff was extremely friendly and very efficient. Changed my oil and rotated tires in no time. Service advisor was extremely nice and explained in detail everything that was done to the vehicle. Excellent staff; efficient and friendly. It was the typical quick oil change, except the friendly employee gave my two kids coloring books. They were very happy and it kept them entertained when they'd usually start getting restless. The coloring books are a genius idea, great job! My representative was very friendly, knowledgeable and helpful. He checked my AC and performed a pressure test free of charge. It was greatly appreciated and help me identify a problem with my Air Conditioning. Roxane was unbelievable and so kind. She explained things so I could understand. She was very knowledgeable and I learned a lot and went home and passed on my knowledge. I believe the young man was Tristan and he was great as well. He was very humorous and kept things interesting. I’ve gone to many different Valvoline’s and without a doubt the best experience. The employees that work on my car were top notch. To be honest I was apprehensive about a woman working on my car. I’ve been wrong this whole time. She spoke clear, informative and completely changed my mind about Woman working on cars. I Thank her for that. This is the best Valvoline shop in MA. They folks there pay attention to details. The do their job, limit the upsell and are friendly. Like many of these establishments there is always to feeling you are going to be sold more than just an oil change. It was true here, although not as heavy handed as other place. Quick service and a clear explanation by the team of the service and pricing. Evan was great! He is honest, thorough and very helpful. The customer service is on top class. People are very friendly. I didn't have to loose some hours in my job. The staff is obviously well trained and mannered. They moved quickly and communicated clearly and politely. First let me start by saying that the staff at the Woburn Valvoline were all very nice and professional. My frustration is with the prices you charge for an oil change. My car is a high mileage car so it takes the synthetic blend which I en up paying over $60 dollars for. At most gas stations I can get this service from around 45ish. Second, I did feel pressured to get a new filter when I actually felt that my filter looked pretty good is the first place. I was also told i need to replace my transmission fluid and Radiator fluid. When i asked what the price was, I was quoted 240 dollars!!! This seem excessively high to me. I do like the convenience and the quickness of the drive through, but I do feel Valvoline has higher prices than most places that preform the same services. Over all I am happy with the service I received but I WILL shop around for better prices next time or perhaps use more coupons for my next visit. The Shop was clean and the staff were great and friendly! Work on lowering your prices and I believe that Valvoline would gain more customers. Thanks. I did not like the upsell aspect. I just wanted an oil change. No need to sell me on anything else. If you offer other services, you should post those on signs on the wall and let it go at that. The whole "car fax" connection made me really uncomfortable. Felt intrusive. I was very please with my visit. That girl knew everything about cars and she was easy to relate to because I'm a woman too. She was thorough and knew what could wait and what didn't need to wait. It's always been difficult for me to keep up the maintenance on my vehicle but she made it hassle-free & haggle-free. Thanks! The customer service was great right from the beginning. The techs explained the differences in pricing for oil change. I did not feel pressure to upgrade or get additional services. They explained everything clearly so I understood it.I was greeted and attended to right away. Staff and manager where prompt, timely and professional. Explained entire process and provided step by step process information. Very knowledgeable and extremely professional in their handling of each customer and individual needs. Mostly I like the friendly people. Don't so much pressure, Jiffy Lube awful! I have a new vehicle which I took for its first oil change. I was told it requires Synthetic oil which I wasn't aware of, so the cost was much higher than I expected. Not really your fault, but affected may experience. Charged $20 & $40 for air filters that cost $6 each on amazon. First guy talking to me did not communicate effectively. Spoke monosyllabically and did not answer me when I asked a few questions until I repeated them.At end, I asked for a receipt, which they said was emailed to me, but I asked for a printed out copy. They gave me a delay and tried to not give it to me, but finally printed one out. The knowledge of the staff. The record keeping of my automobile so I don't have to think about it. The speed and accuracy of their service. The customer service was fantastic. James was incredibly friendly, knowledgeable, and courteous. Ryan and Katie performed the maintenance quickly and without a problem. It was my first time there. Very impressed. There was no wait time outside or inside the bay. Staff was professional and polite. One of the techs set up my odometer to let me know when I need service, aside from the sticker provided. When told what services I will need soon, I politely took not but let them know I will have them done with my mechanic, staff was very receptive to this and was not pushy. Everyone was nice and quick . I been visited there more than ten years and had no problem. They took care of my oil in a timely fashion for a solid price and they rotated my tires. I may have had an advantage as I was the first customer of the day. I was long overdue for an oil change and had a tight schedule. I was so glad to hear that the facility opened at 7 am! I was treated respectfully and the service was done quickly. Friendly and knowledgeable staff. I went at a busy time on a Saturday and did not mond the additional wait, but the staff kept people moving and apologized for the delay. Needed more service. Did not gave money. No pressure was told would get discount on service when returned with money. I called Valvoline for a quote and was emailed a coupon for a $15 discount. I printed it and went to the place. They said that they could not honor the coupon. I will never go back. I feel like everytime I go- they ask me to do this and that. I know its my choice to do it or not but they talk me into it- I end up spending a lot more than I anticipated going in. Everything went fine. Employee was patient and explained everything. Service was fast. Staff prompt and courteous. Simply thought they were a well “oiled” machine. Prompt. Effective. Efficient. Helpful. Because of the pressure to change transmission fluid. I needed to replace a headlight, the part was backordered, so staff recommended where I should purchase it. When I brought my car and part back to them, they replaced free of charge. So friendly and kind. Quick, good customer service, reliable. Once I turned down additional service all I saw was clerks back. No thank you good day nothing. I had issues using a Groupon, but the staff helped me correct the issue. Great and fast service. Reliable speed to get you out quickly every time. It’s the reason I get the oil changed there. I came for an oil change and it was recommended to do a transmission service. He said $129 and because I was getting an oil change(I had a coupon for that) that he could discount the transmission service. I said ok. The service tech was very nice but had a very hard time filling the fluid. Not sure of the amount of time total but they were apologetic. He gave me a total that seemed high but he was now rushing because of the time it took. When I asked for a reciept(a woman) she said they are paperless and I would get it in my email. When I got home not only did I not get a discount on the transmission service, I was charged $149. I am not going to go back and fight over the total, just disappointed. When I reviewed the bill later there is $9.99 extra oil fee that was not explained. Very convenient service. Employees were fast and friendly. I always get treated excellent at Valvoline.ive been a customer for many years. I've been going to Valvoline for several visits for a synthetic oil changes. I feel I'm there often and spending a lot of money for oil changes. Synthetic oil is supposed to last 8,000-12,000 miles and my sticker placed was suggesting to come back after 4,000 miles. This is why I feel like I'm there so often and spending a lot annual for oil changes. I feel this is misleading. team members were pleasant, helpful, and proactive with advisements. Not pressured but at the same time in good hands and guidance. I went in after he bad snow storm in New England cause my car was shaking and oil light was on. not knowing much to nothing about cars the people there were honest and helpful. They could of charged me for an oil change and I would not have even know it but they were honest and helped me clear out my wheel wells so my car would stop shaking. Evan was polite and very informative. He offered suggestions of upcoming services for next oil change so I can prepare financially. I had often visited this location in the past and had been quite satisfied. But the crew from my recent visit had lost all of my information from the system, did not offer me a choice whether I wanted normal oil or the very expensive synthetic, and neither offered me my receipt nor obtained an email address so they could send it. I had to stop and request it...and they didn't appear to know how to print it at first. I got the impression that the shop was full of brand new and inexperienced techs who couldn't even greet their customers waiting in the cold. They are always kind and know what they do. I waited about 45 minutes. The price doesn't match the service. They gave me the wrong sticker in my car and they almost let me drive away without paying. Long wait, too many customers showed up at once. The employees were very friendly did their best to make us happy. Courteous staff explained and answered to my question well. Staff was friendly as usual. Katie and Roxanne both were involved in my service. Was met outside and advised of the approximate wait time. Then directed to a bay and immediately started to service my car. That’s the definition of customer service. I received fast service from friendly service people. They indicated additional services i would be needing soon but did not pressure me into buying them at that time. I was in and out in about 30-35 minutes without ever leaving my car. This valvoline is always quick, the people don't waste time and always have a good sense of humor. I will use Woburn as long as I live in this area. Other valvolines I've gone to I've not had as good an experience with timeliness And their need to upsell anything I didn't want or need. The staff at the Montvale Ave location is always really pleasant! The staff was very friendly and went above and beyond to thoroughly explain everything they were doing and answered all of my questions. My oil change was $122! When I go to the Volvo dealership, I pay around $75. Thought this was insanely expensive. However, the employees were wonderful and attentive. My ONLY complaint is the price. I had to wait longer than anticipated and a car that came after me got in before me- but I wasn't in a rush or anything so it's fine! I was impressed. I was asked to come back the next day to check the fluids because I came in after only driving a couple of miles and my car was not hot enough. I would have never know the difference. Good job Valvoline! I mean it’s an oil change. Just bad timing where only one bay could move quickly as the other two bays had cars that had problems. I appreciated the fact that the staff could tell me what Chevy recommends as the oil I should use (which was an upgrade from my coupon) but that they didn’t pressure me otherwise. They did recommend some other services which are good maintenance items to be aware of with costs so that I could be aware when I decide to do them. These are all great things but I guess since I just came to get an oil change and hat was accomplished Ithete probably wasn’t much you could do to knock my socks off. It was a good experience all things considered. And I’ll be back as long as I can get a great price. If folks are nice and it helps me with my budget, I am satisfied! Much less pressure than other companies that’s for sure. Was very disappointed with the fact I had to pay for a top off. On of the reasons I go to VIOC was for the free top offs. Staff was very busy.came out and talked to you.very friendly and courteous especially the gentleman in charge james.you should be proud to have someone like him working for you. It just seemed that it would have not taken as long. I did get oil change, manual transmission flush and tire rotation. I was there about an hour. I suppose I can't say how long these items take to accomplish so it will not deter me from going back. Rep was awesome! Very informative. I have come to this Valvoline before and return time and time again because I like the way I am treated and I feel confident with the staff. I wanted a conventional oil change, I was advised that you do not have 10W - 30W oil for a conventional oil change so I had to buy up to the next level which I didn't plan on. Seems that older cars are not treated the same as newer ones, if the oil is not refined at that weight anymore then I think Valvoline should provide a more cost friendly option. This is my 1st experience with this problem and I change my oil frequently. I have been a long time customer. I have never had a problem with service. I finally had someone who helped me with service that didn't ask about buying something additional. The staff were genuinely helpful friendly people! Excellent staff, Tina remembered as a past customer and greeted me even though she was not in my bay. Derek(?) my point of contact was great personable. I was satisfied- it is an oil change, not a hotel stay!This time was super fast, but that is a product of how many others decide to go get oil change at the same time as me and not in the control of the service center. I was very relieved that they could perform the service I needed. My headlight was out and it was getting dark! Very professional staff made this visit quick an easy and fast we mapped a plan for future services. very professional and all the talks are informative and constructive. Typically, I love this location and have never had any issues but this time around I felt a lot of pressure to spend money I explicitly said I wasn't prepared to spend. I was told I needed my rear differential fluid replaced but I never actually said yes before they went ahead and did it. I appreciated the discounts given to me, but when I asked if I could use my coupon the associate didn't even check, they just said no, they had already applied all discounts possible. Everyone was nice and service was quick. I like staying in the car especially because I usually do this with my children coming with me. Makes it way easier! Was told I would receive $10 new battery. When I went to pay they said it was $10 off the entire service. I had a $12 off an oil change and they would not take it. Wish they communicated that more clearly in the beginning. They always try to recommend more services. Always nice to work with, polite and courteous, but a routine oil change never seems to be enough. If I can't afford a service that's recommend, it doesn't matter how much you tell me it's necessary for the car to function, I can't afford it. I liked the guy waiting on me but the girl down below was very slow. I go here for all my oil changes on my truck. They do a great job there and I am very happy with the personal and the service and also the products. The gentlemen that worked on my car were both very friendly and explained everything that they were working on thoroughly. Also, I greatly appreciate the fact that they did not try to push any additional sales on me in addition to the oil change. Service was quick and price was reasonable. Staff were friendly and answered my questions about services they suggested without pressuring me. It really was the pressure to buy services.... the guy talked to me in a pretty condescending way. I've not experienced that at other Valvolines. The staff was very unprofessional. There was banter going on the whole time and miscommunication between members up top and down below the vehicles. The kindness of the staff and the speed at which they performed the service. The price was a little high and they said I should change my rear differential without even checking it. Polite staff. Explained everything they did. Answered all my questions. Enjoyed watching them work as a team. I generally do not give out a "Highly Satisfied" rating unless something extraordinary happens. I was very unsatisfied with the oil change from this location due to the high cost for simple oil change. If I went to a store, I could purchase 5 quarts of full synthetic with a filter for $26.00. Taking into account of the work performed on my car which took 15 minutes, they billed me $41 to complete this task. $160/hour to perform simple car maintenance is highway robbery. I spoke to the attendant about how expensive this service was, and he didn't even care. In the future, I will make sure to either do this type of work myself or go to a place I don't mind giving my money to. There is no need to give money to people who just don't care. Felt condescending the way the staff was talking to me about what I need to have done on my car and felt like they were pressuring me into adding items to my bill I made it clear I only wanted a basic oil change. Additionally it was expensive for a basic oil change. I don't like the attempts to upsell. I just want my oil changed. Very polite and informative. Manager was a big help with coupons. The staff that took care of my car were great. It was a busy day at this location and they took the time to explain what my car needed. There was a manager named Roxane who was very knowledgeable and professional. Derek explained everything in great detail. Getting an oil change is actually very nerve wracking because I always feel pressured. At this visit it was pain free, I will be back. Thank you!! I know some of good workers there because I'm regular customer went there many times. They are in good hands for my car. The staff member who assisted me was also a Jeep Cherokee driver, which made me confident in his recommendations. It was quick , informative , with very personable people as well as knowledgeable. I was moderately satisfied but it was mentioned that I had multiple services 'due' that visit. I felt this to be an attempt at upselling. I explained that I have had another oil change plus had other work done since my last visit to a Valvoline. I further explained that I don't solely use Valvoline for my oil changes. They stopped that attempt but another worker later attempted to get me to purchase an air filter. I explained that I refused to pay the high markup and will buy one on my own elsewhere. Someone else's name was associated with my car in the system. I have been to another Valvoline and they had the correct name. Attendant kept insisting that I must be or know the person whose name was in the computer. I had never heard the name before. Also, they did not reset the "change oil" light inside the car which they did at the other location. Overall I am highly satisfied. My only issue is the car's automatic message center wasn't reset so it still says "life of oil is 5%"
A female employee was scolding a younger male employee regarding his use of the bathroom without asking. I considered it unprofessional to do this in front of customers. I feel like there have been price changes in the company. I really appreciated when you used to have one free top off in between oil changes, and I thought the tire rotation was a free service. I was shocked to have to pay $114 for an oil change and tire rotation. I don't like the feeling of having to buy or donate money to a fund. In this case the Jimmy Fund. I threw the cards away that were given to me. Price is pretty high for an oil change, even with synthetic. Otherwise fine. the young man who waited on me was very helpful! The customer service is a step above. It was quick, friendly staff, job done right! Not much pressure on buying/paying for more than I had planned. Might be bias as to what I'm used to when getting my oil change. Last time I spent 75 bucks on an oil change I was able to get the oil I wanted 10w40 which I like to use in the summer with my older vehicle. Wish I was greeted when I pulled up, there was more then enough staff standing around, and for the value there should complimentary drinks for guests, like water, coffee and a couple choices of soda to choose from. Excellent service in Woburn on Montvale Ave! Greatly appreciated the near zero wait and friendly, no pressure service. Also, appreciated the great answers to a few questions. Thank you!